Integrating new surgical robotics system with the BrightMatter™ platform allows neurosurgeons to perform surgery with an enhanced, high-definition view of the brain. Tampa, Florida (January 4, 2018) – Florida Hospital Tampa is the first hospital in Florida to acquire the latest generation robotic imaging technology for use in neurosurgery that provides neurosurgeons with a more complete view of the brain during surgery. 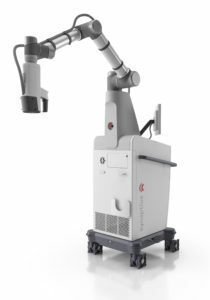 Synaptive Medical Inc.’s BrightMatter™ product suite, including its next-generation Modus V™ robotic arm with digital microscope, transforms imaging, surgical planning, patient data collection and intraoperative vision from disjointed analog methods to a fully integrated platform with navigation, robotic automation, digital microscopy and data analytics. Modus V™ is Synaptive’s second generation robotic digital microscope. “Florida Hospital Tampa is the first health center in Tampa and central Florida to acquire our full BrightMatter platform and one of the first hospitals in the world to use Modus V. We’re excited to give doctors there the most advanced tools to treat their patients and provide best-in-class solutions for brain and spine surgery,” said Peter Wehrly, Synaptive CEO. Modus V is Synaptive’s second-generation, high-powered digital microscope with a robotic arm derived from technology used on the International Space Station. It sets a new standard for robot-assisted neurosurgery with the most powerful optics available on the market that provide unprecedented views of patient anatomy, and may allow surgeons to perform less invasive procedures with more precision. For patients, less invasive procedures may lead to faster recovery times, reduced complications and, in some cases, may render an inoperable diagnosis operable. “This acquisition was made possible by contributions of some of our community’s generous donors, who are dedicated to bringing next-generation technology like Synaptive to the Tampa Bay Area. It’s technology like this that allows us to provide more advanced and safer care for our patients,” said Jan Berry, Executive Director of the Florida Hospital Tampa Foundation. Florida Hospital Tampa is a not-for-profit 527-bed tertiary hospital specializing in Digestive Health, Cardiovascular Medicine, Neuroscience, Orthopedics, Women’s Services, Pediatrics, Oncology, Endocrinology, Bariatrics, Wound Healing, Sleep Medicine and General Surgery, including minimally invasive and robotic-assisted procedures. Also located at Florida Hospital Tampa is the renowned Florida Hospital Pepin Heart Institute, a recognized leader in cardiovascular disease prevention, diagnosis, treatment and leading-edge research. The recent addition of the Doc1st ER shows that Florida Hospital Tampa is committed to providing compassionate and quality healthcare. Part of the Adventist Health System, Florida Hospital is a leading health network comprised of 26 hospitals throughout the state.